Was listening this morning to the system for a bit. TG #1 sounds like protective services. I heard them checking different locations at various buildings downtown. I forgot my notes but 2930001 sounds like it is the dispatch person (they referred to him as admin) also I noticed slot 1 blinking on my scanner. What does that mean? There were 2 other TG that were active which sounded like maintenance. They were working on air handlers and fire pump testing. Ok. Here is what I can guess to some of the TG’s that are by listening to the system the last few days. 2403 - Public Health? (Talk about clinic and sending people in to visitation). 1 Protective Service/security or what ever they go by now. I have not heard any a Deputy’s or Detention yet on here. So I guess they are slowly switching people over. What does slot one mean? If I recall I saw “Slot 2” also at one point also. SLOTS 1 AND 2 in this case are unique to TDMA, TIME DIVISION MULTIPLE ACCESS systems as opposed to p25 phase 1 which is a FDMA, FREQUENCY DIVISION...system. In TDMA, 2 seperate talkgroups can share the same voice channel/FREQUENCY with a first in basis of the #1 talkgroup(TG'S) assigned to time slot 1 and the 2nd in talkgroup assigned to time slot 2 but both TG'S using one single frequency. With FDMA these 2 same talkgroups would require 2 seperate voice channels/frequencies and a phase1 scanner would miss talkgroup 2 activity while locked on talkgroup 1. With a TDMA scanner you can possible listen to both talkgroups activity in stereo with example talkgroup 1 in the right ear and talkgroup 2 in the left air with the scanner sitting on 1 single frequency. I do this with a sdr dongle and sdr sharp outputting IQ DATA to the DSD+ DIGITAL DECODER with DMR systems because there are no p25p2 systems where I live. 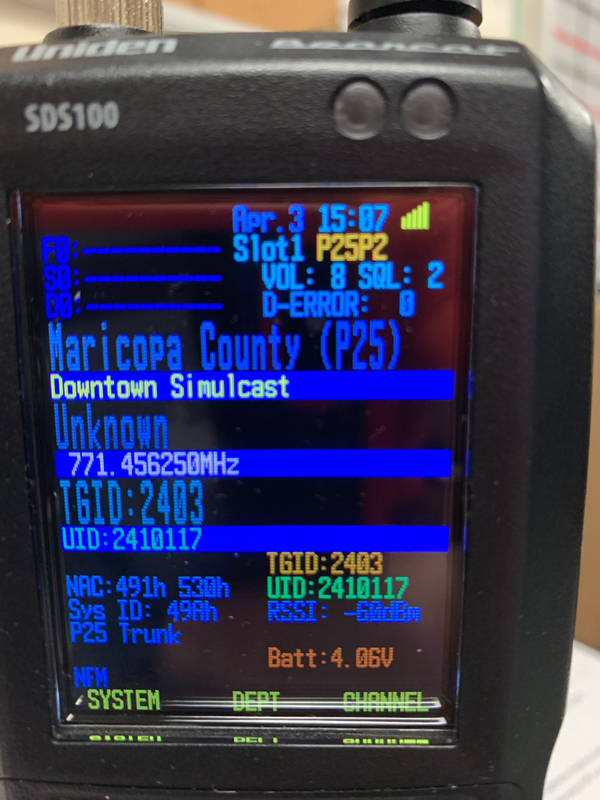 To do this with a phase 1 FDMA system simultaneously listening to 2 TG'S at the same time requires 2 scanners. It seems like they are slowly adding people to the system. I will listen more next week when I have some time. I need to get back to listening to this system more as well...good to see it coming to life. Thanks for posting the update. 2701 sounds like parks. They were just talking about a campsites that was packing up early. I did not hear which park it was. Not sure if they are doing one for each park or how. Got a couple hits on 1301 from the White Tanks site today. I think 2701 might be White Tanks Regional Park as I got a lot of hits from that at the White Tanks site as well. I picked up the parks yesterday. It was the entry point talking to the nature center. Not sure how the new stuff is set up yet. I did not pick up any new stuff today listening. Anyone else listening to this system? 1203 Animal Control tac or maybe they have it divided like East and West or North and South? I thought I heard them talking then saw you post this. I noticed that the old system 800, has like 15 sites. Think they will add more? Many of the sites are simulcast sites having multiple transmitters per site. They are improving their coverage compared to the old system.